Maher pulled off a hat-trick of wins this weekend, taking the GCL Madrid final for his team London Knights, the individual CSI5* speed class, before riding the 9 year old chestnut gelding to victory ahead of home hero Eduardo Álvarez Aznar (ESP) with Rokfeller de Pleville Bois Margot and Nicola Philippaerts (BEL) with H&M Harley vd Bisschop. Remarkably both Aznar and Philippaerts clocked the exact same time - to the millisecond - uniquely finishing in joint second place in the LGCT Grand Prix. As the sun began its slow descent over the beautiful Club de Campo Villa de Madrid, Santiago Varela Ullastres’ course was another clever challenge requiring three key ingredients - scopey jumping, careful precision and absolute control. Using the full expanse of the foot perfect grass arena, and built specifically for the undulating field, the flowing track was a true test for the world’s best, promising mouth-watering sport for the fourth leg of the Championship race. There was disappointment for former LGCT Grand Prix of Madrid winner Maikel van der Vleuten (NED), after 8 faults ruled him out of the running, and the local fans' hopes were dashed after Sergio Alvarez Moya (ESP) clipped the final part of the Longines double with Charmeur. 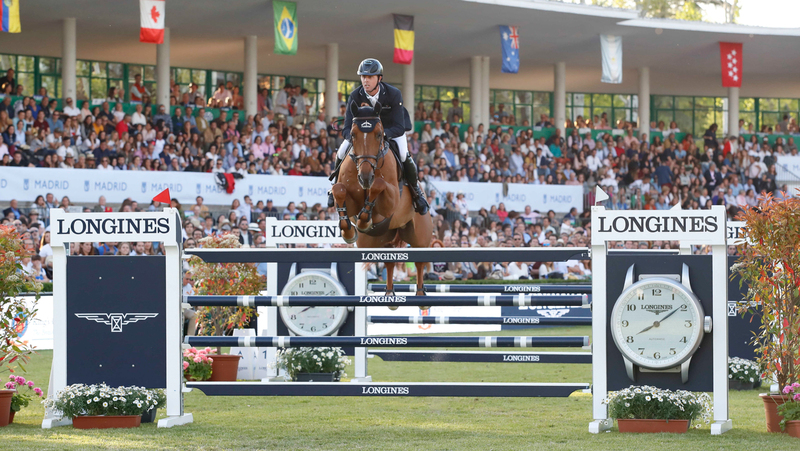 Similarly, former LGCT Grand Prix of Madrid Marcus Ehning (GER) and Pret a Tout collected four faults in exactly the same spot, meaning a podium would remain elusive for the German maestro. They would be joined by Pieter Devos (BEL) with Espoir, Marc Houtzager (NED) with Sterrehof's Calimero, Nicola Philippaerts (BEL) with H&M Harley vd Bisschop, Danielle Goldstein (ISR) with Lizziemary, and Ben Maher (GBR) with Explosion W. Local fans had plenty to celebrate after Eduardo Álvarez Aznar (ESP) with Rokfeller de Pleville Bois Margot went clear, the home favourite pulling off a perfect round to book a place in the jump-off. Pieter Devos (BEL) and Espoir raised the temperature, jumping clear in 40.54s, just easing ahead of Veniss’ early time, delighted with his round. Marc Houtzager (NED) and Sterrehof's Calimero opted for a steady clear, finishing in 43.29s and keeping them high up the order. The crowd erupted in applause as home hero Eduardo Álvarez Aznar (ESP) with Rokfeller de Pleville Bois Margot entered the arena. Placed on the podium here in 2016, the pair looked determined for a strong result, the Spanish rider having grown up in this very arena. Lightning fast around the corners, the duo galloped towards the tricky final fence, with fans holding their breath while watching the clock. Remarkably they finished in 39.79s - exactly the same time as Nicola Philippaerts to the millisecond. So with the pair in the joint lead, only Ben Maher (GBR) and the 9 year old Poden Farms owned Explosion W - the final pair to go - could change the order. Following the GCL Madrid final, Maher had said that Explosion was quick, but the pair put the pedal to the metal, the British Olympian managing the young horse beautifully. They blasted around the arena, drawing gasps from the crowd, and took out a stride to the last to stop the clock in 37.73s, almost two seconds faster than the rest of the field. Jan Tops, President Longines Global Champions Tour: "You would not think it could get any better than today with the crowd and the sport, everything is amazing. Ben wins the first leg of the League, wins the team competition and wins the individual qualifier and today wins the Grand Prix. At the moment he is the favourite with Scott to win the overall. The formula is fantastic for the riders and also the sport. We have been working in our team on the graphics, the riders compete one after the other and everything is more transparent to follow." This place has great tradition, a special Spanish Latin atmosphere and it was fantastic the public stayed right to the end. Oxer are very professional working with our team. We have great footing here, course design, everything count. It is only the fourth event but we will know the overall winner after Doha. Ben qualifies for the Longines Global Champions Super Grand Prix in Prague on the Saturday night which will be amazing for the sport with every jump and every leg and competing for big prize money." Alvaro Arrieta Konyay, President Oxer Sport; "We have 108 editions of horse shows here and it is a fantastic mix between historic shows and the modernity and excitement of GCT. Congratulations to the riders today. We are very proud and very happy for today, the crowd was full and it is great to host such shows with such sport. Thanks to Jan for believing in our team at Oxer and thanks to the City and to our sponsors." Scott Brash, Overall LGCT Ranking Leader: "There are so many more events to go but I am delighted with today. Ursula is amazing, she did three clear rounds and it was just the rider that was not fast enough! "I think Madrid was an unbelievable show. It is a breath of fresh air. From the horses’ point of view this show is definitely one of the best on the Tour and it shows with the competition today." Nicola Philippaerts, 2nd Place: "I tried to do my best. I was a little slow to the last line. My horse jumped very good today he really feels good for the rest of the season." Eduardo Alvarez Aznar, 3rd Place: "At that moment I did not realise we were equal, I saw I was ranked 1. I am still very happy. This atmosphere in my country, in my home. This was my club for many years. I was riding here. I am very proud of my horse. It was the first outdoor show for Rockefeller and I am more than happy." Ben Maher, LGCT GP Winner: "It was really about riding the course how it needed to be ridden and it was great sport. He (Explosion) has always been a good horse, but this year he has really come forward. He has a great character and really enjoys his job and the way he does it it doesn’t take a lot out of him. He is bucking, playing in the warm up arena and really enjoying his job. He will take a bit of a rest now. We are very fortunate, the Poden Farms team, we have a lot of horses. He (Explosion) is quirky, he has character but he is a very friendly horse and gives 110%. He is a naturally fast horse so I just use his natural speed. I planned to do 7 strides and it was right there and everything was just coming up wow."